Offer wrens, chickadees, and other songbirds a stylish new home in your backyard by mounting the Heartwood New Chick Chickadee House. Heartwood's classic cypress shingles and copper ridge cap perfectly complement the subtle green color of the house, while the durable cypress construction will last for years. A 1.125" diameter entrance hole leads to a single cavity, perfect for your smaller songbirds. 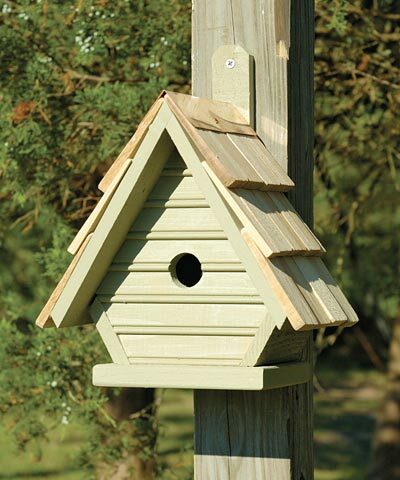 Proper ventilation and drainage help make this house the ideal haven for your birds. An attached hanging tab allows you to mount this home to a post, and the included copper cleanout panel on the back of the house makes nest checks and cleaning quick and convenient. Watch chickadees flock to your yard to roost in this New Chick Chickadee House. Handcrafted in the USA.